SAN JOSE, CA--(Marketwired - Jun 11, 2013) - Plastic Surgeons Drs. 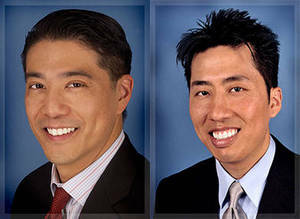 Jerome Liu and Tom Liu have announced the addition of Sientra® breast implants to Liu Plastic Surgery, their private practice. Composed of high-strength cohesive silicone gel, Sientra® implants received FDA-approval in 2012 and are designed in a variety of shapes and projections to provide several aesthetic and safety benefits to breast enhancement surgery patients. The two plastic surgeons say they are excited to offer the new Sientra® breast implants at Liu Plastic Surgery in order to expand size, shape, and projection options for their patients. Sientra® implants are available in both a round shape and an anatomical shape, giving patients considering breast augmentation a wider range of choices. Additionally, the San Jose plastic surgeons note that the round gel implants are available in either a textured or a smooth shell. Dr. Jerome Liu also highlights that patients can choose among high, moderate, and low profile projections for more natural-looking results. In addition to a variety of shapes and textures, Sientra® breast implants have multiple designs which include taller than wide, equal height and width, and wider than tall. With so many options available to patients, the San Jose plastic surgeons say the concept of a one-size-fits-all implant is an idea of the past and patients can now choose a breast implant that better meets their goals and expectations. The addition of Sientra® implants to the market broke a 20-year duopoly over the U.S. implant manufacturing industry, says Dr. Tom Liu. When the implants launched in 2012, Sientra® became the first brand of implants to sell exclusively to board-certified and board-eligible plastic surgeons. The company is also the first to provide the United States cosmetic surgery market a form-stable, anatomically-shaped implant that is FDA-approved. According to the San Jose plastic surgeons, Sientra® also provides the best warranty the implant industry has to offer, giving $3,600 for surgical assistance for 10 years and a lifetime warranty (including contralateral replacement) on the implants themselves. Additionally, they say patients receiving Sientra® implants at their San Jose plastic surgery practice will automatically be enrolled in the warranty service at no additional cost. Ultimately, Drs. Jerome and Tom Liu believe that Sientra® breast implants can help patients more effectively achieve their cosmetic breast enhancement goals. Dr. Jerome Liu is a board-certified plastic surgeon. A graduate of Brown University, he earned his medical degree from the UCLA David Geffen School of Medicine. Dr. Liu has authored over 50 peer reviewed articles, book chapters, and research abstracts regarding plastic and reconstructive surgery. He is available for interview upon request. Dr. Tom Liu is a board-certified plastic surgeon. A graduate of Northwestern University, he earned his medical degree from the University of Chicago Pritzker School of Medicine. Dr. Liu's plastic and reconstructive surgery research has been featured by the New York Times and NBC. He is available for interview upon request.